“I want to climb Everest, but there is so much negative press about it. I don’t want to add to the problems.”, she added with genuine concern as I was having coffee this week with two 20 something aspiring climbers. Her statement got my attention. On one hand, I admired her ethics, on the other, damn it, she shouldn’t let anyone stop her dreams. With the 2016 season now over and people making plans for 2017 and beyond, I want to, in private 🙂 , have a few words with those of you who summited this year and make a few suggestions for those thinking about 2017. Haters can skip this post. There at 7.4 Billion people on earth. About 7,600 have stood on the summit of Everest. That is 0.000001% of the current world population. A rare club if you ask me. For ‪2016 from the Nepal side only, the Nepal Ministry of Tourism reports a total of 456 summits – 57% were Sherpas and of the 287 permits issued to foreigners, 199 or 69% summited. We will have to wait maybe 6 months for Himalayan Database to compile stats from Tibet and Nepal but I’m expecting about 600 total 2016 summits. It is easy to let the haters, including many in positions of responsibility in the adventure community, weigh on your accomplishment. I’m always surprised when leaders in climbing clubs, outdoor magazines and even some well known Everest guides feed the press with negative stories of why Everest is no longer a challenge; that only the rich and inexperienced are there and that “anyone can walk the “yellow brick road” to the summit. But my favorite is the ‘climber’ who summited any year prior to yours and proudly states “Well, Everest is not like it was when I did it. MY summit was earned, unlike those people this year.” Kind of reminds me of Clint Eastwood in Gran Torino. Amazing that those who share in an rare accomplishment are so fragile that they cannot give a simple word of congratulations. 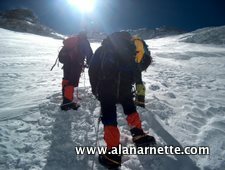 Now; I accept, and make myself, many of the arguments and criticism around Everest including the ones about inexperience – members, Sherpas and guides – but to generalize is lazy and a negligent mistake – especially for anyone who is writing an article that may appear in well known publications. So, where is all this headed? Yet another Everest Deserves Respect article as I have been know to do from time to time? Nah, just a few words to my fellow summiteers and those aspiring to next year. Now that you are back home from Nepal or Tibet and going thru all the emotions that comes from summiting Everest that I went thru a few days ago in my Climber’s Depression blog post, I simply want to say CONGRATULATIONS! It was a good year on Everest by almost any standard as I summed up in the 2016 season summary. Looking at the historical stats on the Himalayan Database, from 2000 to 2016, the summit rate was 56% for members so this year at 69% was well above average! Way to go! Many of the long time commercial operators had greater than 80% success rates. In fact, all but one team had at least one person (member or Sherpa) on the summit. A longer than usual series of acceptable weather days made it possible. But of course, five people lost their lives, so as always it is a muted celebration. And there is real trouble brewing on Everest with way too many inexperienced climbers, and guides. But let’s stay focused on you. Hey, you set an ambitious goal, trained hard, climbed smart to the summit and returned home. You earned that summit and have every right to be proud of it – full stop. Ignore the haters, stop reading the outdoor magazines and websites for a few months. You know what you did, and you know better than someone who has never been out of their zip code what Everest demands of people. Most Everest Climbers Deserve Respect????? So what is with the “most” in these headlines? Well, the tragic truth is that many, if not all of the deaths this year might have been avoided as I covered in Why People Die on Everest. And some of the summits were near misses with only the unselfish decisions by teammates, guides or Sherpas that prevented more deaths. I was there this year, attempting Lhotse and saw a similar pattern I saw in 2015 when I was also there attempting Lhotse. Way too many ‘climbers’ that had zero business being there. They failed to understand the basics of climbing, much less mountaineering, and they depended on guides and some Sherpas who were just as inexperienced. They thought they knew enough. Arrogance kills. So with this backhanded complimentary article thus far, what about next year’s aspiring climbers? First, it is going to be crowded. Nepal extended the 2014 and 2015 Everest permits and some come due next year. And don’t think going to the North is the solution, the line is forming on that side already. After this year’s roaring success, the guides are selling Everest 2017 as “Everest is Back in Business, Everyone is Welcome”. I think not and want to discourage the majority of people reading this article not to climb Everest in 2017 – you are not ready. Q: How long will a 4 liter cylinder of oxygen last running at 2 liters per minute or 4lpm? Q: How do you keep your hands warm if you loose a glove at 7500 meters? True/False: Being so tired you can barely move is normal on Everest or any extreme altitude. If you don’t know the answers to these question, you are not ready to climb Everest. If you think you know the answers but with the first question your highest is under 7000 meters, you are not ready to climb Everest, and this include Aconcagua and Denali and most critically Kilimanjaro. I know, I know, many people who have summited Everest only had Denali and Aconcagua and did fine – well did they? What was their experience like? Did they suffer frostbite? 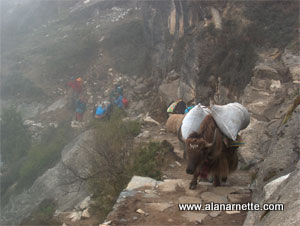 How independent were they or where they tightly controlled by an experienced guide or Sherpa? Many people who summit Everest fail to tell the whole truth and nothing but the truth about their experience. Don’t let their personal story lead you astray. Please Climb, but Climb Smart! I’m not joining the haters and saying don’t climb Everest. I’m saying get the experience. And one more time, Kilimanjaro is experience to attempt Aconcagua, not Everest. My advice to mountaineers who want to climb Everest is that please please please put ample amount of time in training hard from all levels – physical, mental and above all technical, and climb a whole bunch of 6000ers, 7000ers, and if possible even an 8000 meter mountain before showing up on Everest. And come on the mountain with such a mindset that if things go wrong you should have the right training and attitude to get yourself out of the situation, or at least be able to follow instructions to get out of the tricky situation. As always, I have followed your outstanding posts. My dream just to go to Everest basecamp will always be a dream and, I longingly gaze at the summit in pictures. I will continue to live vicariously through your posts from my armchair in Kansas. My best to you, Alan. Great food for thought, Alan! I´m currently making my mind up whether to try to climb Everest in 2017 or not. The mountain certainly won´t get any cheaper or less crowded in the future – and I won´t get any younger. At least my highest is over 7000m. Everest is a unique and gratifying experience for those who are ready and prepared. After my first attempt at age 46, I thought – oh well that was my first and last shot …. but then after I summited at age 54 (on my 4th attempt), I thought – I am sure am glad to have had the benefit of time and age to truly appreciate this result. Great article. I guess I’m not going to Everest anytime soon! Can you please elaboroate? Having climbed a few 5000 or 6000’ers is not sufficient prep for Kilimanjaro? What in your opinion is the right prep for kilimanjaro? I probably should rephrase to make that clearer but in my opinion, Denali, Aconcagua and especially Kilimanjaro are not sufficient experience for Everest. I suggest any of those plus an 8000er. As for Kili, I agree with you that most any 4000 or 5000m climb will be enough. After failing your Everest Test you will be pleased to know that I wont be climbing her any day soon! Come on Colin! Test are for learning not for punishment!